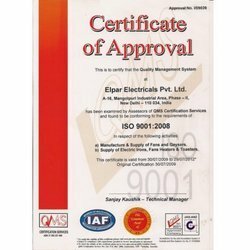 Being an ISO 9001:2008 Certified Company, we believe in manufacturing Electrical Appliances at par with the international standards. We have a Quality Testing unit at our organization to assist us in this endeavor. It is managed by a team of skilled quality analysts and has modern testing machines and tools. In order to ensure quality from the very beginning, we procure high grade raw material from reliable vendors. Our team of quality analysts monitors the whole process at every stage and strictly follows international parameters. Their sincere efforts are helping us in offering superior quality Electrical Appliances to our customers. Our endeavor to provide total satisfaction to our customers has facilitated us in garnering a wide customer network throughout the country. We understand the requirements of our customers and offer our range accordingly. This has assisted us in developing a trustworthy relationship with our customers. Assisted by our well organized distribution network, we deliver the consignment with in the nominal lead time. To further assist our customers, we also have a Customer Care unit at our organization; it is managed by trained and experienced professionals. This unit helps customers in various ways like handling their queries or grievance, if any and help them in running their business perfectly.